The median U.S. home value has risen 6.5 percent year-over-year to an all-time high of $206,300 — a number that is only expected to increase in 2018, thanks to double-digit decreases in inventory. According to Zillow’s December Real Estate Market Report, nationwide inventory has fallen 10 percent year-over-year — the third consecutive year of annual declines. In high-priced and high-demand markets such as San Jose and Las Vegas, for-sale inventory has fallen 41 percent and 27 percent year-over-year, respectively. Simultaneously, in those same markets, home price appreciation has skyrocketed. Median home values in San Jose climbed 21 percent year-over-year to $1,171,800, while Las Vegas home values grew 14 percent to $246,700. 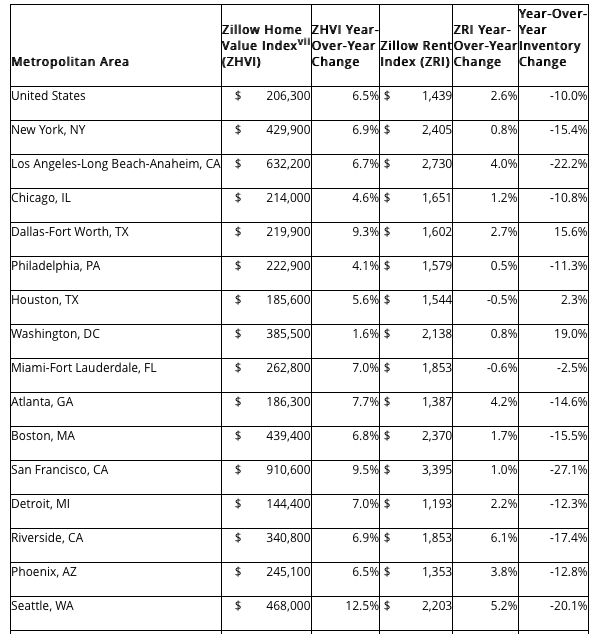 Seattle rounded out the top three with a 12.5-percent hike to $468,000. “Tight inventory fueled by a tight labor market and low interest rates propelled home values to record heights in 2017, but the outlook is now much less certain,” said Zillow senior economist Aaron Terrazas in a statement. Buyers aren’t the only ones grappling with rising prices — renters are dealing with a 2.6 percent year-over-year rise in median rents ($1,439), the highest rate of appreciation since June 2016. Sacramento knocked Seattle out of the top spot for rent appreciation with an 8 percent year-over-year increase to $1,838. Median rent in Riverside rose 6 percent year-over-year ($1,853), and in Seattle, rents rose 5 percent ($2,203).